We call Woodbug Cabin a 'Posh Bothy'. A bothy traditionally is a very basic, one room hut where walkers find shelter and a place to cook and sleep whilst exploring in the hills. 'Woodbug Cabin is just such a hideaway but with our 'posh treatment', it provides a great place to stay, with all the home comforts of a modern kitchen and shower-room located in a more accessible place with a heap of comfort and style thrown in. 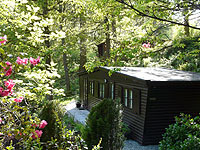 The cabin is located in peaceful mature woodland on a private estate, and is equipped with all you need for a cosy quiet comfortable break. Outdoor furniture enables you sit on the patio where bird life and occasional deer and badgers may appear. Ten minutes walk, or two minutes drive, brings you to the hamlet of Skelwith Bridge with its spectacular waterfall, shops, Chesters café and The Talbot pub for bar meals. Heating is by efficient electric wall heaters. Free Wi-Fi and a pay phone are available in a communal Spa and Pool Hall from March to mid-November, also coin operated washing machines and dryers. An open plan living area, with picture windows to the front and side, looks out directly on to the lovely woodland scene and furnished patio. All furniture and fittings are modern and high quality. 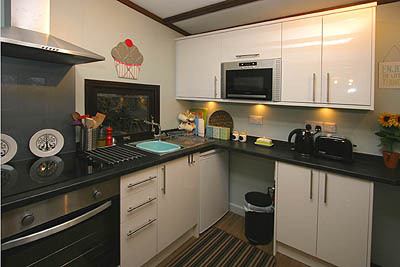 The kitchen/diner is modern and extremely well equipped with everything you’ll need to wine and dine after your day out. 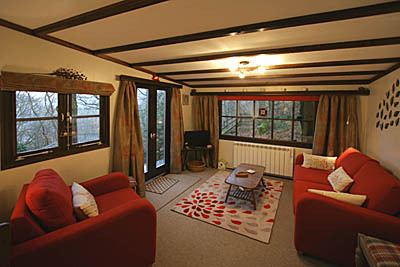 The double bedroom also has a window onto the woodland. It has oak furniture to store all your gear. The shower room has a powerful electric shower and there’s a heated towel rail and vanity unit. All mod cons are available including radio, Bluetooth and iPod music dock and digital TV and DVD in the living area. 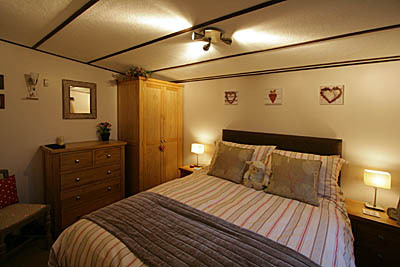 Weekly rates are £329-499 and 3/4 night Short Breaks are £249-299, according to season. Changeover days are flexible. Rates include freshly laundered bedding & towels, all utilities and unlimited wifi. The lodge is totally non smoking and we regret no pets.